Prince Eugene Bullen was born in Grenada in August 1895. 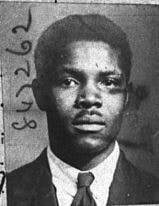 In his late teens or early twenties he entered the sea service and migrated to Britain. It is probable that he was part of the merchant marine during the First World War as his shipping documents state he was ‘still in service’ in early 1919. When exactly he settled in Hull remains unknown, however by the mid-1920s he was working on vessels which embarked from this region. In 1926, Bullen was employed as the chief cook on board the City of Pretoria which sailed from the port of Hull. On the crewing list he was described as a 33-year-old West Indian man who was five feet and seven inches tall and weighed 164 pounds with no distinguishing marks on his face or hands. He continued to be employed as a sailor for many years. Around 1933, Bullen stated a romantic relationship with Ada Saltus. The following year the couple lived together in her residence at 94 York Road. Saltus was described by the Hull Daily Mail as ‘coloured’ and further research has indicated she may have been born in Bermuda or of Bermudan descent. She frequently travelled to the island from Liverpool in the 1920s presumably to see her family. She had been married before and had a son, however had separated from her husband. She may have suffered from mental health issues as in 1932 she tried to commit suicide because she was, reportedly, so unhappy. The circumstances surrounding this event are sadly unknown, but the following might give some clues as to their unfortunate domestic affairs. 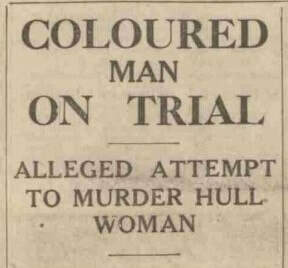 Hull Daily Mail, 16 November, 1934. On 10 August 1934, Bullen was arrested for the attempted murder of Saltus. 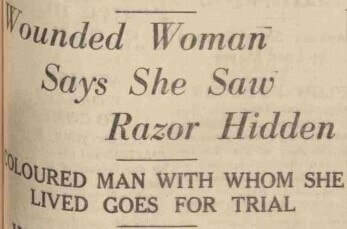 He was tried at York Assizes and she was called to the witness box to give her version of events on 16 November 1934. In her statement Saltus reported that Bullen had continually used threats against her and showed he had a violent streak. She stated that one night in the summer, the couple had been to a neighbour’s house to play card games and while walking home he had a pocket knife in his hands which he kept sticking into railings. Bullen realised her fear and declared “You need not hang back. You will never know what is coming to you.” Saltus also claimed that on a different occasion, Bullen had bruised her lips and throat. However, he told the court that she had rubbed lipstick on the marks on her throat to make it look like he had hurt her in order to illicit sympathy. He also said she was lying about the other incidents. Hull Daily Mail, 3 September, 1934.
was quiet for approximately an hour before shouting about a pain in his head. Saltus declared that she had fallen asleep after that but was woken later in the morning with Bullen kneeling over her with a knife in his hand repeating “We are going to die together.” She snatched the knife and hurled it towards the window, but it missed and landed in the corner of the room. Bullen then dragged her by her hair to the place where the knife landed. Saltus told the court, that she had screamed for her son Robert but by the time he entered the room, her lover was cutting her throat at which point she passed out. Shortly after she came around and fled, running down the stairs and into the street. ​The following day Bullen was asked to take his stand in the witness box. He said that Saltus had given a false statement and she had attacked him in a frenzy. He declared he had woken up in the early hours of 10 August and Saltus had begun to quarrel with him for no reason. He asked her not to argue as he wasn’t feeling very well. To extract himself from the situation, Bullen suggested that he got out of bed and began to put his clothes on, but she tried to prevent him. The couple argued, and she rushed over to the table with a knife and threatened to cut his clothes off. A struggle then followed and he told the court “I lost my head, and she got cut.” He regretfully added “I never intended to kill Mrs Saltus. I never intended to do her any grievous bodily harm.” Bullen also admitted that he had cut himself after she had ran out of the house. However, he denied trying to commit suicide. P.C. Johnstone, the officer who attended the scene of the crime, had yet another version of events. He told the court that he found Bullen in his home. He had a shirt on which was covered in blood and was standing at the top of the stairs. The officer asked Bullen to come down and inquired into what had gone on in the house. Bullen replied that Saltus had become very hostile when he had got out of bed to smoke. He then began to put his clothes on and she called him a ‘foul name’ which led him into a rage, so he grabbed the pocket knife off the dressing table and attacked her. Bullen was found not guilty of attempted murder but was sentenced to 12 months imprisonment for wounding with intent. Due to record closures and privacy laws we do not know much about Bullen after this date. However, it is possible that this was the same man as the Prince Eugene Bullen, who died in South Glamorgan in 1986. ​ Documents suggest that his length of service was 12 years in 1926 and therefore we can deduce that he entered the maritime sphere around the age of 19.